Posted on September 17, 2010 October 29, 2011 by Tarleisio	This entry was posted in Uncategorized and tagged 1971, 1982, Chanel no 19, Guy Robert, Iris, Perfume. Bookmark the permalink. Fantastic story. I love how you became a subversive among the subversives. Since my perfume obsession bloomed earlier this year, I haven't smelled any Chanel. I think I'll get to sniffin' this frosty number. I haven't had the opportunity to try any from the Les Exclusifs range, but both Cuir de Russie and Bois des Iles (which used to be their own, and are now part of the Exclusifs) are heartbreaking, or rather, they were, back in the day. I haven't been near either of them in years. But good, bad or indifferent, Chanel – one of the last independent perfume houses on the planet, incidentally – always makes quality stuff. Give Ms. Frigidaire a try! She might surprise you! Ah, good story! I know some squatting/dumpster-diving girls, who make disparaging comments about “perfumey ladies” . 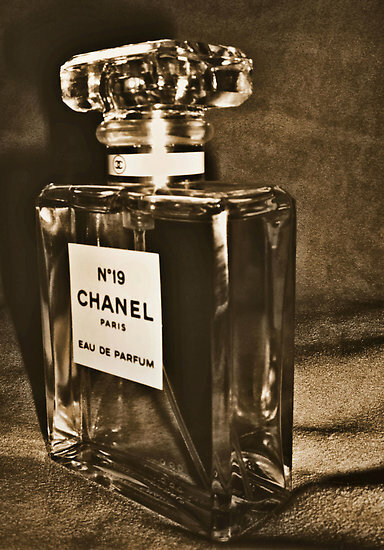 . . but I always think smell and taste are the last senses to be subverted – hence my penchant for wearing perfumes that repel and horrify (Dzongkha, Borneo 1834, and icy monster green-chypre demons come to mind), or wearing my (thrifted) Chanel No. 5 with rattytatty clothing . . .
Actually, I can totally understand Borneo 1834. It's not for everyone – indeed, it's not for me – but I can certainly understand the fascination with repellant/unusual/eccentric. I quite like it – on someone else who isn't me. Then again, I'm developing a crush on La Myrrhe, so maybe I'm getting weirder and more subversive as I get older. Ah. If there's any Green Monsters out there I might be missing out on, let me know. I've rarely met a Green Monster I didn't like! Dee – indeed it is, and no. 19 is perfect for spring! Enjoy it – I know I do! Congrats! Wonderful. I read this some time back, but dee's recent purchase reminded me of it. I love the idea of your visit to the department store, but wondered what else you tried, and how you fastened on Chanel 19 (apart from your inherent good taste, of course!). Anne Marie, you have to remember – this was 1982. Several alternate universes away…and certainly in perfume! I seem to recall an AWFUL lot of..Giorgio Beverly Hills, and awful it certainly was in any incarnation! But I do remember the ones I gravitated towards in those days, so I think I can say that Dioressence was in there, somewhere, and Vent Vert and Ivoire (which I still wear), Fidji, too – the only one of my mother's perfumes I could ever wear, and I dearly wish it wasn't ruined now. There was a Ralph Lauren I really liked called Tuxedo (wonder where that one went? ), and one perfume stuck in my mind, but I wasn't old enough to wear it at 19 – and that was Cabochard. Finally, one more I dearly wanted to buy and somehow didn't until later – and that was YSL Rive Gauche. You see a theme here? None of these were overly 'floral' or even very girlie, and several classify in the 'green chypre' family – a favorite even then. But these are the ones that I can recall – if not from that one department store excursion, then from several others like it at the time. So, then. Chanel no, 19 it was in a square splash bottle. I've loved it ever since in every incarnation. Yes, I do see the pattern there. How annoying that so many great fragrances have been discontinued, reformulated, rebottled into expensive 100 ml bottles etc (Dioressence and som of the other old Diors), but Giorgio just keeps on keeping on.